What many people here in the States know as Most Extreme Elimination Challenge was actually a real Japanese game show during the late '80s called Takeshi's Castle - a game show so brutal and punishing that few ever claimed the final prize. MXC, on the other hand, simply took Takeshi's Castle and chopped it down to the parts that everybody really cared about - clips of people humiliating themselves in painful-looking ways. And it was hilarious. 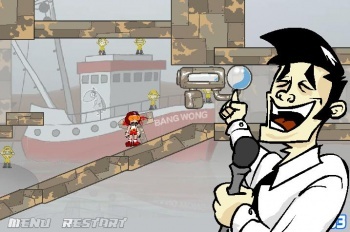 That's kind of the principle behind Newgrounds' latest well-promoted title, the kind-of-offensive-but-actually-really-funny Ching Chong Beautiful, developed by The Swain. Your brother is kidnapped by Mr. Beautiful, whose obstacle course is A.) known to be deadly and unbeatable and B.) the most popular TV show in Japan. In order to save your brother, you must get a thoroughbred horse, and the only way to do that is - you guessed it - enter Ching Chong Beautiful. You're no Super Mario, either. You're out of shape, you slide if you run over water, you trip down stairs, you struggle to run up walls, you fall in painful-looking ways before tumbling to a halt, and it's a riot and a half the entire time. Best of all, every time something notably awful happens, the crowd will hoot and the announcer will taunt you - just like the schaudenfreude of a real Japanese game show. It's kind of challenging at points, and some of the controls (notably the wall jump) take a little time to get used to, but Ching Chong Beautiful has tons of style, great production values, and will make you want to go watch episodes of Takeshi's Castle. What better way to celebrate Christmas than with somebody else's pain?